ALTIUS' High Speed Internet service gives you speed that makes your Internet experience fly - whether you're surfing the web, downloading files, or just checking email, you will be connected at a DSL like speed that is up to 50 times faster than dial-up. Downloads are up to 2 Mbps and uploads 256 Kbps. ALTIUS' High Speed Internet requires virtually no configuration on your part - We will install a small antenna on your roof and plug a cable into your computer or router, and you are connected! Our wireless modem optimizes the network connection, ensuring a simple and high-performance Internet experience. ALTIUS will provide a Professional Installation to insure the aesthetics of your home or business are maintained. The Professional installation consists of placing a small antenna outside your home or business and running a cable to your computer or router. ALTIUS is expanding coverage in North County areas soon. Please let us know your address for service availability and we will notify you when service is available. 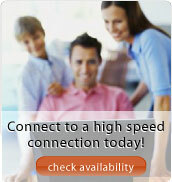 ALTIUS Broadband provides the High Speed Internet connection only. If you require an email account, or other services like virus protection or firewall installation, please call us for more information.